NEW YORK (Reuters) - The dollar fell and the rally in global equities lost steam on Tuesday as a U.S. threat to slap tariffs on hundreds of European goods and a downgrade by the International Monetary Fund in its global economic growth forecasts dimmed the appetite for risk. U.S. Treasury Secretary Steven Mnuchin told lawmakers the Trump administration is preparing for the possibility of a "hard Brexit." "Even if it's not so good, it is going to have a positive effect on the economy because it is going to remove an uncertainty," he said. MSCI's all-country world index, a gauge of stock performance in 47 countries, fell 0.37%. The pan-European STOXX 600 index closed down 0.47% and the FTSEurofirst 300 index of leading regional shares fell 0.41%. 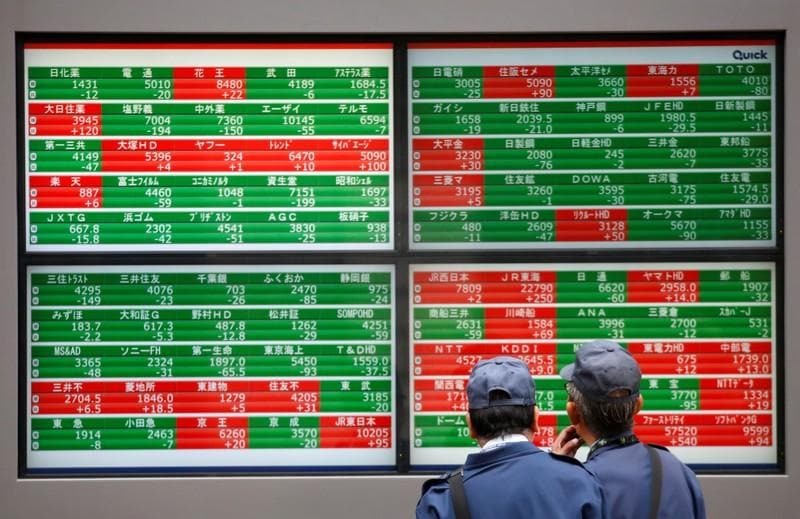 The yen rose as traders favoured the safe-haven currency in the wake of the U.S. proposal for tariffs on European goods. Oil fell from a five-month high above $71 a barrel after Russia signalled a possible easing of a supply-cutting deal with the Organization of the Petroleum Exporting Countries.